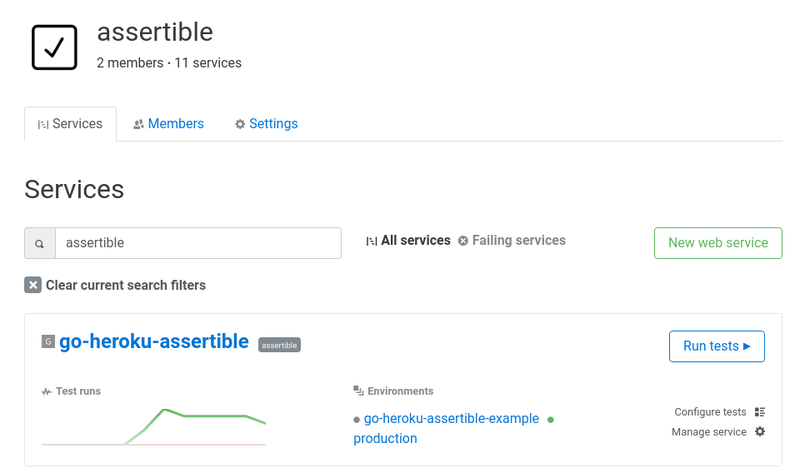 Assertible's organizations make it possible to let your whole team collaborate in the testing process by sharing access to web services, tests, and more. Name: The name of your organization. This name is used as a unique identifier for your org and is used in various error messages, integrations, and other areas of the dashboard. You can invite new team members to your organization by visiting the Members tab of your Organizations (seen in the image above). In this form, you'll provide the email address and role of the new member. The role of a new member is either Member or Admin. Organization Admins can view billing information (credit card details are hidden), delete services, and manage member access. Standard members have more limited access to testing related resources. If you need to cancel an invitation to an organization after it has been sent, you can do so from the Organization Members page. Every pending invitation will show in the members list with an option to Cancel invite. Organizations have their own billing and subscription settings for managing payment methods and plans. These options are accessible from the Settings tab of any organization page. Organizations are free to use, and can be upgraded at any time if you've outgrown the free plan. Learn more about organization subscriptions on the plans page.